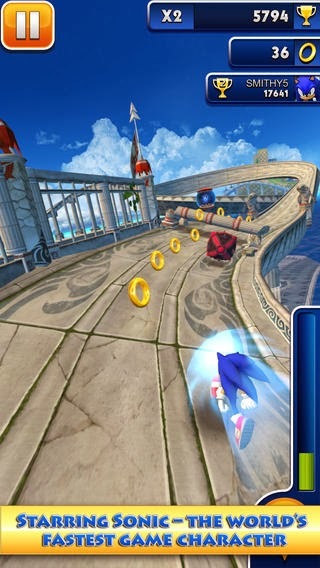 Please note Sonic Dash supports iPhone 4 and higher, iPad 2 and higher, iPod touch v4 and higher. Play as Sonic the Hedgehog as you dash, jump and spin your way across stunning 3D environments. Swipe your way over and under challenging obstacles in this fast and frenzied endless running game for iPad, iPad mini, iPhone & iPod touch. Sonic’s arch nemesis Dr. Eggman has arrived and wants to stop him running! Use razor sharp reflexes to dodge Eggman's mines and missiles and take to the sky and show him who's boss! Defeating Eggman gives a large score bonus that can be boosted further by equipping the Enemy Combo Booster. Another global challenge is approaching with fantastic prizes up for grabs including another collectable character as the star prize. Want to hit the track with a classic blend of style and attitude? Then you need Rouge the Bat! This challenge is all about score so make sure you complete missions to increase your score multiplier and equip boosters to score even higher. New achievements have been added for Silver the Hedgehog. Make sure you check them out and see if you have what it takes to complete them all.